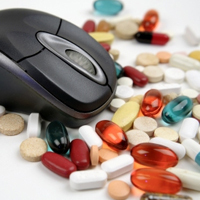 Buying your prescriptions online can save money, but online pharmacies and shipping service can affect the medications that you purchase online. In general, you will need to have a prescription for federally controlled medications, including opiates, before they can be shipped to you. There are some basic guidelines that you can use to ensure you get your medications at the lowest cost without worrying about shipping restrictions when buying online. If you are planning on buying medications from an online pharmacy and shipping restrictions are causing you concern, the best thing to do is learn exactly what happens when you purchase a prescription online. A reliable pharmacy will ask for some documentation, such as a prescription and a copy of your identification, or will provide an on-site physician who can provide you with a refill prescription. You will typically need to answer questions about your condition, your general health, and any other medications that you may be taking on a regular basis. Government rules and regulations do vary by state, so you may not be able to use an online pharmacy unless it is licensed and allowed in your particular state. Typically, you will find that online pharmacies and shipping restrictions are limited to specific types of medications. For example, opiate painkillers may be regulated strictly and you may not be able to order from any pharmacy that isn’t licensed in the United States. International pharmacies, such as those located in Canada, may have approval to ship to patients in the US. Restrictions vary significantly based on your state and the pharmacy that you want to use. You may want to begin by narrowing down your options to find a pharmacy that does ship to your state and that offers the price that you are willing to pay for your medications. Which Medications Can I Purchase? If you are buying your medications from an international online pharmacy and shipping restrictions exist, then you won’t be able to purchase any medications through that pharmacy. Pharmacies that are FDA licensed and recognized can ship most medications right to your home. Online pharmacies often carry a wide range of treatments for many different conditions, including depression medicines and medications for erectile dysfunction. A local pharmacy may also offer online ordering and shipping to your home. When using a local pharmacy there are no shipping restrictions to worry about. You may find that international online pharmacies offer slightly lower prices, however, so finding out the basics of online pharmacies and their shipping service can help you save money. If you already have a prescription then you may find that an online pharmacy can offer refills without needing a prescription each month. Article contributed by Sally – an avid blogger and teaches at a Chicago area elementary school. She loves to travel and can be found on Twitter @eatbreatheblog. I’m an avid traveler and blogger. I love music, art, people and how the three intermingle. I play music and am actively involved in my church. No smoking, no pets, the occasional beer… that’s about it.